The Montesinos Orphanage and Environmental Technical School is located in Titanyen, a quickly growing settlement approximately forty minutes north of Port-au-Prince, Haiti, that is gaining regional importance. The school was founded by a young and highly dedicated parish priest in the region, Father Charles Moise. With no funds, Father Charles began to educate street orphans, leading to his groundbreaking proposition to empower street orphans, the most disenfranchised social group in Haiti, to be environmental stewards and future leaders of their country. This attitude and his belief that environmental issues are at the heart of Catholicism are the keystone goals that have distinguished this school and community. In a place like Haiti where environmental degradation is some of the most severe on the planet, restoring the earth’s capacity is both an environmental and human rights issue. Because of this, the school not only provides K-12 education to orphans and local children, but also provides adult education in sustainable agriculture, building, and infrastructure practices. The physical infrastructure of the community and school were funded by Caritas Roma, along with several Haitian non-prof¬its. Design work and infrastructure design, as well as technical assistance to create a planning process, was funded by a Partnership University Fund Grant. This made possible the support of teams of students, professors, and professionals from Portland State University (PSU) and École Spéciale d’Architecture in Paris to contribute and work together to design a master plan for the school that envisioned its future growth and expanded role in the greater community of Titanyen. After a determined effort often disrupted by the fragile and unstable social and political situation of Haiti, the school and dormitories for the students were completed and the CPID began to look at possibilities for design-build interventions to improve the quality of life at the orphanage and support the social life of the community. Students involved in the design-build project were challenged with developing a framework for inhabiting the courtyards at the orphanage, which are exposed to harsh sun, wind, and downpours in the rainy season, typical conditions in tropical environments in the Caribbean. The project aimed to provide shade, outdoor seating, opportunities for privacy, and a mechanism for water collection and plant growth. The question became, can we create a framework for co-existence that takes advantage of the cooling qualities of shade, natural winds and ventilation, allows plants and humans to co-exist, and capture rainwater and wind to make both happy and grow? Over the course of several months and multiple weekend design charrettes, the group developed an elegant design for shading that would also provide seating and direct water to strategic points to be captured in a bioswale system without the use of gutters, which are a liability in the hurricane prone areas of the Caribbean. 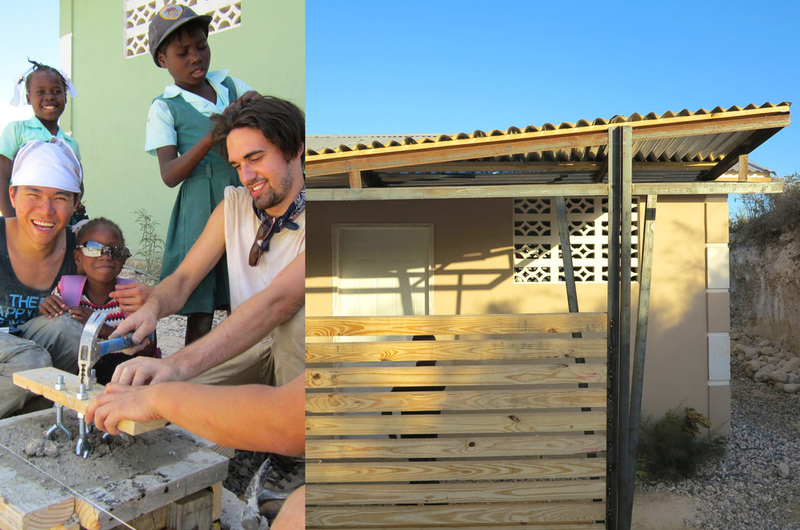 In early 2014, the group traveled to Haiti with CPID faculty members, Sergio Palleroni and Todd Ferry, to complete the design and build the work. The team created two extensive shading structures that now complete the girls’ dormitory compound. 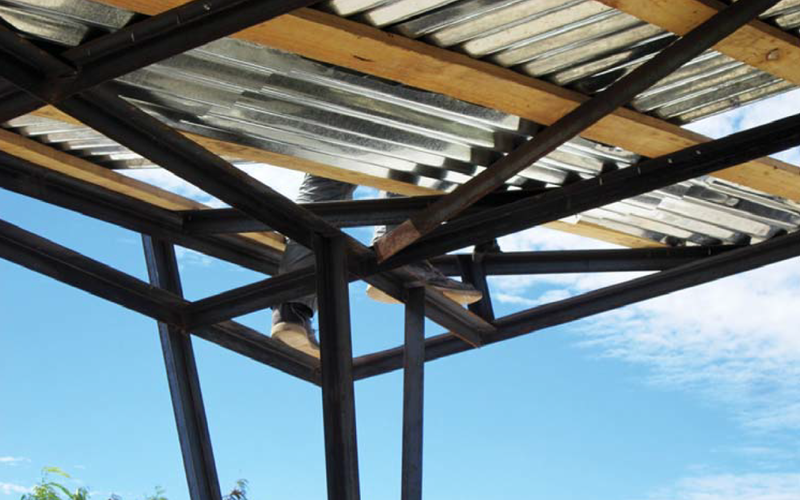 The design takes materials commonly used and readily available in Haiti to create an expressive steel frame of triangulated columns, which support a galvanized metal roof. Each structure has a large wooden bench built within one of the structural bays, taking advantage of the angle of the columns to install a reclining back to the bench, which also creates some welcomed vertical shade and privacy. The result is a much needed comfortable social space that has become a critical linkage to creating the gardens that the dormitories will need to truly become the living oasis that they were meant to be. The materials were decided upon once the students learned of the tradition of welding and the ubiquity of steel angles and corrugated metal roofing in the area. The triangulation resolves a longstanding issue in the use of local steel, which is often of too small a caliber to use in hurricane conditions. Like a tree, the triangulation creates multiple ‘branches’ to carry the load but also withstand wind loads. The roof gains much of its expression by folding in multiple places in order to increase the structure’s strength while directing water to strategic points to be captured in a bioswale system below without the use of external gutters, which are difficult to find and maintain in the area. Creating a roof that acts to direct water to specific and needed locations helps to resolve the issue often encountered with gutters in Haiti that never survive the hurricanes that batter this island multiple times a year, but are needed to feed bioswales and gardens. The bioswale will increase the likelihood of growing vines, plants, and trees in otherwise difficult soil. 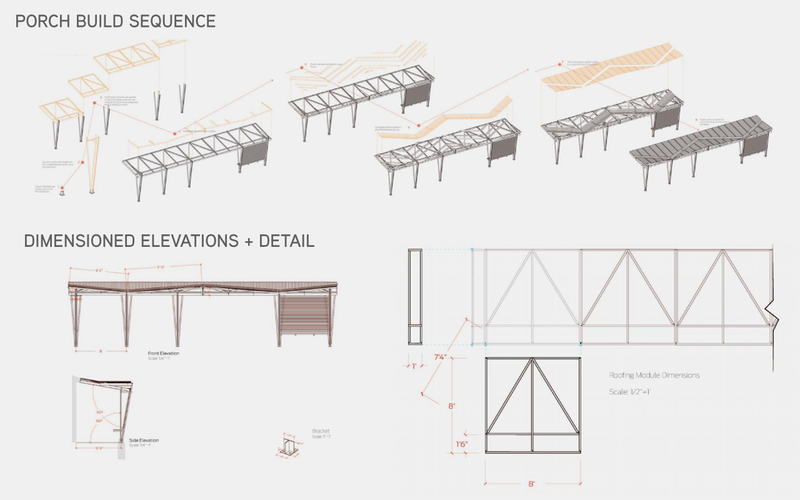 Although incorporating a full swing into the structure would have been problematic for a variety of safety and structural reasons, the students designed a low, swinging bench that is easily the most beloved part of the project, perhaps largely because the girls are aware that their own swing design led to the incorporation of the glider-swing into the project. 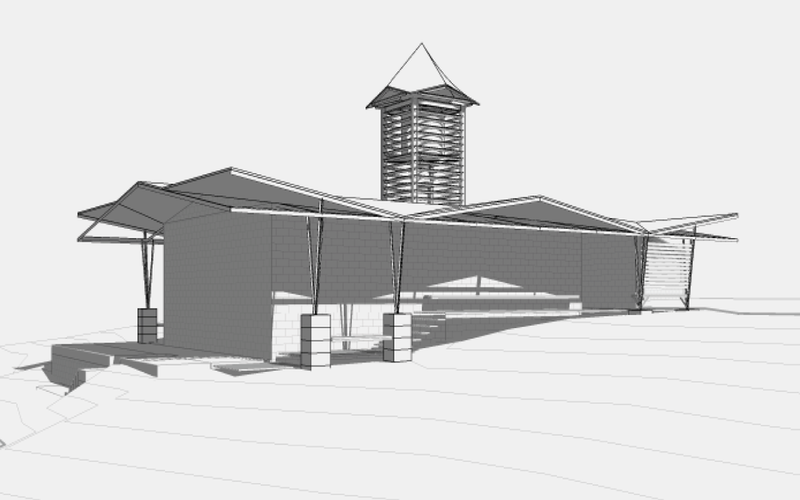 Future plans of the CPID for the project include raising funds to design and build a bakery at the orphanage. Bread plays an important role in the Haitian diet, though the currently available is made from refined flour, which has limited nutritional value. The school would like to use the millet that they are already growing on site to make healthy bread, which will both feed the children and raise funds by selling at the Titanyen roadside market, which has rapidly grown in the years since the earthquake to become an important regional center. Currently, the only available bread is shipped in from Port-au-Prince, which is over forty minutes away.